Travel Costs > How Much Does TSA PreCheck Cost? The TSA PreCheck program, offered by the Transportation Security Administration, allows you to go through the physical screening portion of the airport without the need of removing your shoes, laptops, 3-1-1 liquids, belts or light jackets. Paying a small fee, which we will discuss below, 93 percent of TSA PreCheck passengers wait less than five minutes in line. The program was established in 2001 and was designed to allow low-risk passengers to expedite their time in the security line. The costs of the TSA PreCheck program will depend greatly on how you plan on applying for a membership. If you plan on signing up via the official website, then you the costs are about $85 for a five-year membership. Now, keep in mind that if you pay the fee, it does not mean you will be automatically in the program since the TSA will need to run a background check and confirm your membership. If the TSA rejects your application for some reason, then you will not receive a refund. This fee, however, can be much less or even free through certain credit cards or loyalty programs we talk about later in this guide. It’s said that if you hold either Delta Platinum or Diamond status, then you can choose a $100 voucher for either Global Entry or TSA PreCheck for Platinum members or a $200 voucher for both programs as a Diamond member. Which airports and airlines participate? 200+ airports participate in the program, including the top 30 airports in the United States. If you do become a member, the airport needs to participate in the program in order for you to take advantage. Follow the link to see if your airport qualifies. As for airlines, a full list can be found here, with most major airlines, including Delta, American Airlines, JetBlue and Southwest participating. If you have been at the airport before, then you already know the struggle of taking off your belt, shoes, jacket along with pulling your laptop out of the bag. With TSA PreCheck, you can leave on any light outwear, jackets, belts and also keep your liquids and laptops inside of your bag. Essentially, this makes carrying on luggage much easier as you do not need to take everything out and back in again once you get past the security checkpoint. Even if you do have TSA PreCheck, the TSA can still randomly pick you out and pull you for an extra screening. To start the program, you will first need to sign up for the program via the official website and fill out the application, including personal information such as your citizenship, date of birth, address and immigration documentation if necessary. This entire process will take about 15 minutes to complete. If the TSA decides to approve you, your account will remain active for five years, but when the five years expire, you will have the option of keeping it if you choose to do so. After you fill out the application, you will also have to complete an in-person appointment at one of the 350+ enrollment centers, providing your photo ID and a proof of citizenship. You will also be asked a few questions related to your traveling and fingerprinted as well. At this time, as long as the TSA approves you, about two to three weeks later, you will then receive what’s known as your “Known Traveler Number” and with this, you will then be able to use the designated TSA PreCheck security lines at participating airports. With this Known Traveler Number, you will then need to add it to your reservation when booking a flight, usually online, but some airlines may force you to do it over the phone. In the case of a frequent flyer, some airlines allow you to add your number to your profile, adding it automatically to all reservations. With this information, “TSA PreCheck” will be printed on your boarding pass, allowing to access the designated lines. For those traveling with children younger than 12, then children are eligible to use the line without a membership. The entire process can take less than four weeks on average. To fly, you need to be a United States citizen or lawful resident and successfully pass a background check. Aside from the background check, there are disqualifying offenses that will automatically deny your application. Incomplete or false information can disqualify you as well. The Global Entry program allows you to go through the expedited screening process as you re-enter the United States from a foreign country. 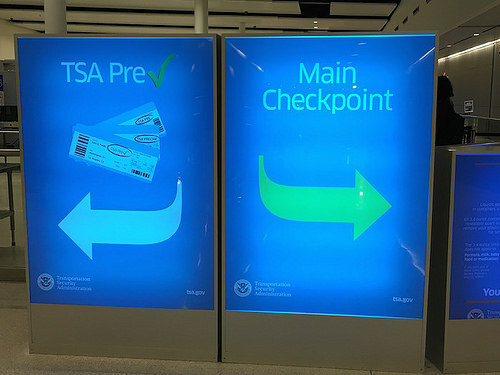 Administered by the U.S. Customs and Border Protection, you are provided access to the TSA PreCheck program if you are a Global Entry member, but it doesn’t guarantee you access. For both, the enrollment process is similar, including the interview process, online application and the fee — about $100. NEXUS will offer you access to both PreCheck and the Global Entry program and is known as a joint program between Canada and the United States, allowing efficient travel between the two countries. In addition to this, NEXUS, unlike PreCheck, will not provide expedited entry into Canada. SENTRI, quite similar to NEXUS, offers expedited entry into Mexico and again, like NEXUS, SENTRI will be required to take advantage of the opportunity. CLEAR does not work in conjunction with the Global Entry program or PreCheck since it works in partnership with airport security authorities. With CLEAR, you can simply skip the identification line and will then need to proceed either to the regular TSA physical screening line or the PreCheck line if you have a membership.